Description: Two D9s pull the late 19G into Allentown Yard. Description: On a hot, hazy and humid morning, a westbound stack train rolls under the new signal bridge. Description: NS 9763 makes a grand sight as it comes around the curve with yet another intermodal train. 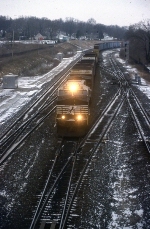 Description: Westbound through CP MO. Description: Westbound on track one. Description: Neat lashup with A&S power in the background. Description: One of the rare type horseheads leads NS coal hopper empties 501 westbound at Perkiomen Junction. Description: Westbound manifest stopped in Hummelstown because the crew couldn't see the signal at CP Tara. Description: A pair of Dash 9's hauls a westbound manifest past an old farmhouse in Hummelstown. Description: Eastbound train at the east end of the yard at Bluefield, West Virginia. Description: Metuchen Road, 1751 hours. Description: Fog and Drizzle make for a miserable morning for railfanning. Dash 9's don't help either.